What is sous vide? How does it work? Here are the answers to everything you've been wondering about sous vide cooking at home. For the past year, I’ve been playing around with Joule, an immersion circulator used for sous vide cooking. I have slowly found myself won over by this new way of cooking and have come to see it as a real boon for home cooks everywhere — not just chefs or food science geeks. Have you ever heard of sous vide cooking? Or tried it yourself? Before we get too far into it, let’s discuss this whole concept of cooking sous vide. “Sous vide” (pronounced sue veed) literally means “under vacuum” or “under pressure.” The method involves sealing ingredients in food- and temperature-safe resealable plastic bags (I like these ones), pushing out as much air as possible (no vacuum sealer required), and then submerging the ingredients in a pot of heated water to cook. When cooking sous vide, food is cooked extremely gently. It’s like poaching, except with a barrier between the food and the water. The temperature is carefully controlled with an immersion circulator, so cooking is efficient and safe. Sous vide cooking also requires much less oil than regular cooking, which I like because I’m both frugal and conscious about healthy eating. Sous vide takes out a lot of the guesswork of cooking. You know exactly when your food is fully cooked and ready to eat. Since the food never gets hotter than the temperature of the water, there’s very little risk of over-cooking! An immersion circulator is the tool that controls the temperature of the water as the food cooks. You can use it in any pot or pan you own as long as the pot is big enough to hold both the immersion circulator and the food. Just clip it to the side of the pan, or in the case of Joule, a magnet on the bottom lets you stand it upright in most pots and pans. 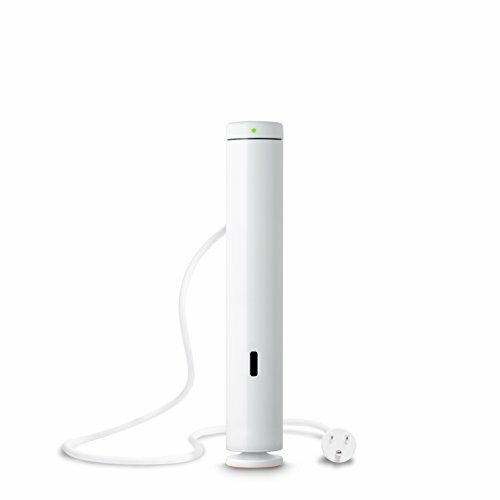 The immersion circulator will pull the water through its internal heating element, circulating the water in the pot and keeping it at a precise and steady temperature. What’s so great about cooking sous vide? Cooking sous vide is another “set it and forget it” way of cooking, just like the slow cooker and the pressure cooker. The biggest difference with cooking sous vide is the level of control you have over the temperature and the flexibility in the cooking time. Unlike slow cookers and pressure cookers, which cook at one temperature, you get to choose and modify your cooking temperature with sous vide. Sous vide recipes typically provide a range of cooking temperatures and times so that you can cook your food to the exact level of doneness that you prefer, like a medium-rare steak or a safely-cooked fish fillet. Another advantage that I can see for sous vide cooking is flexibility. Since this cooking method is so gentle, you have a pretty big window in which your food will be ready. This means that you can start your food cooking, go run some errands or watch your kid’s soccer game, decide to swing by the post office on the way home, get stuck in traffic, or do any number of non-cooking activities — and all this time, you never have to worry about your food. If you’re not back right when the timer goes off, no big deal. Cooking in plastic is weird. And it feels kind of wrong. I totally get that, and it’s been a big hurdle for me, as well. In addition to the worries that many of us have about contact between food and plastic, there’s also just the oddness of cooking food in plastic. It’s definitely not something your great-grandmother did, and it feels about as far from throwing meat on fire as you can get. When you cook sous vide, the water never reaches the boiling point so there isn’t much of a risk that the bag will overheat and melt. Almost all name-brand resealable freezer bags are safe for sous vide cooking. They are typically made of food-safe plastic and rated to temperatures well above boiling. Double-check the package before cooking sous vide to be sure. I’ve been using Ziploc brand gallon-sized freezer bags for all my sous vide experiments. For the second concern — the weirdness of cooking food in plastic — this is honestly just something that takes some getting used to. I’ve been cooking professionally for over 10 years, and even for me, cooking sous vide was not intuitive. But after a few months of playing around with the cooking technique, it doesn’t feel nearly so strange to me anymore. I should also mention that there are some sous vide recipes that can be made in glass canning jars, like yogurt and egg bites. If you’re nervous about cooking in plastic, these kinds of recipes are a great way to give sous vide cooking a try. Here’s our total Sous Vide Safety Guide–which should cover just about every question you didn’t know you had, and then some! All this said, if cooking in plastic is just too odd or off-putting for you, then no worries. I think that sous vide cooking is great for some people, but isn’t necessarily for everyone. It’s all about finding what works for you in the kitchen, and sous vide is just another option available to us as home cooks – just another way of getting food on the table and knowing that you’ve made something delicious. As I’ve said, this whole idea of cooking sous vide has been a slow process for me. It took some time, patience, and trial and error before I started seeing the role that sous vide might play in my day-to-day cooking. The universal advice for first-time sous vide users is to cook a steak. “Sous vide steak is life-changing,” I heard again and again. I heeded this advice and took my Joule for its first spin with a thick porterhouse. I cooked it for an hour to a nice medium-rare. I removed it from the plastic bag and gave it a good sear in my cast iron pan on the stovetop. There was much anticipation among those hovering nearby with plates in hand. Tasting it, my husband and I both thought it was… fine. Not extraordinary. Not bad. Just…a solidly good steak. Certainly not so much better than our regular stovetop steaks that I needed a special tool to cook it. Undeterred, I carried on. I made bacon. I made halibut. I made potatoes. Here’s where I’ll mention that I think there is a definite learning curve with sous vide cooking. For instance, the temperature of your water is obviously important, but it’s not always clear what that temperature should actually be. When making these first recipes, I followed the basic recipes from the Joule app, the ChefSteps website, and from the sous vide pros at Serious Eats. In other words, the longer the food cooks, the more tender it will become. This is desirable for some foods, like chuck roast, which just get better the more tender they become. But you need to be a little more careful with something like fish where tenderness can lead to mushiness. You always have a large window in which any meal you cook will be delicious, but there is definitely an upper-limit for some foods. Again, for the most part, I followed the recipes on the Joule app, the ChefSteps website, and Serious Eats to guide my cooking decisions. Sous vide cooking definitely becomes more intuitive with time. But for your first forays into sous vide cooking, I recommend following trusted recipes. My first big breakthrough with sous vide cooking was with salmon. I cooked two individual-sized fillets at 122-degrees F for 40 minutes, and this was absolutely the best salmon I have ever had in my life. The salmon was silky and soft, but still flaked apart under my fork. The flavor was deeply salmon-y, but with none of that fishy flavor that can come when you overcook the edges on the stovetop. Also, because I’d cooked the fish entirely sous vide and plated it straight from the bag, there was zero fish aroma in my kitchen — BONUS! This was definitely the moment when I felt like I finally understood what made sous vide cooking so incredible. The salmon was cooked perfectly, I had zero anxiety about under- or over-cooking, I made it on a timeline that worked for my schedule that evening (I went for a run and took a shower as it cooked), and it was better than any salmon I’ve ever had at a restaurant. My next breakthrough was cooking a top round roast. It was the cheapest cut at the market, and after cooking it for 24 hours, it was as tender and delicious as filet mignon. Unlike when I cook filet mignon, however, I wasn’t worried about messing it up. Also, for about $20, I had enough roast beef to invite friends over for dinner and still had plenty left for sandwiches the next week. Budget-friendly meals: Sous vide transforms cheap, inexpensive ingredients into gourmet meals. Cooking time is flexible. With most foods, you have a wide window between when the food is ready and when the quality starts to suffer. You can cook on your own schedule and never worry if plans go awry. Never worry about over- or under-cooking: As long as you’re following good time and temperature guides, your food will be perfectly cooked every time. Make-ahead meals made easy: Most recipes can be cooled right in their cooking bag and tossed in the fridge for later. Just reheat quickly on the stovetop, in the oven, or on the grill, and you’re good to go. This is a great way to make batches of potatoes, carrots, chicken breasts, and other recipe basics. Freezer meals, too! I am VERY intrigued by the idea of freezer meals. You can package all the ingredients needed for a single meal, freeze, and then toss the bag right in the sous vide when you need an easy meal. Mind blowing, right? Right. After playing around with sous vide for over a year now, I truly think that this kind of cooking has a place in our home kitchens. Also, check out this post on How to Use Your New Immersion Circulator. There is way more to discuss about sous vide cooking than I can possibly cover in a single article. We’ve really just scratched the surface, and if you’ve read this far, I’m assuming that you are both intrigued and also probably have a bunch of questions! Please ask your questions in the comments and I’ll do my best to answer. Now I’m curious to hear from you — Have you done any sous vide cooking? What recipes do you love and how do you think sous vide cooking fits into your life? And if this is the first time you’ve heard of sous vide cooking, what questions do you have? What do you want to know more about? What recipes or tutorials would you like to see? When making these first recipes, I followed the basic recipes from the , the ChefSteps website, and from the sous vide pros at . Hi, Sheila! I’m betting that you have an ad blocker on your site that’s blocking our links to the Joule website and showing you blank text. Try adding Simply Recipe to your list of whitelisted sites, and see if you can see the text then! Cool! That did it – you are so clever. I’m in the process of cooking 2 bone-in pork chops as I write this. This is my second attempt. My first attempt resulted in rather tasteless pork. So this time I went Asian and made a marinade and am cooking the chops in the marinade. I’m hopeful.